Instead of just monkeying around (lose 1d6 sanity if you get the obvious pun), try out these great freebies. 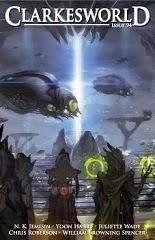 • Now Posted: Beneath Ceaseless Skies Issue #152 — Jul. 24, 2014. Fantasy. • "The Topaz Marquise" by Fran Wilde. • "What Needs to Burn" by Sylvia Anna Hiven. "When I woke, I found the bullet between my wound and the makeshift bandage. The flesh was already closing where my body had spit it out. I pulled off the bandage and cursed a colorful tirade at Shadow, although I knew it wasn't his fault. People with the magic can't help it sometimes. Things just happen around them, though they might not want it to." • At Daily Science Fiction: "Wishmas" by Nina Kiriki Hoffman. Fantasy. • At Every Day Fiction: "Leaving Rhonda for Mars" by Wilma Bernard. Science Fiction. • At Farther Stars Than These: "UFO" by Alfonso Colasuonno. Science Fiction. • At Nature: "A Long Way From Home" by Sylvia Spruck Wrigley. Science Fiction. • At 365 Tomorrows: "Emotional" by Steve Smith.Science Fiction. "Introduced by the author, explaining how the story was inspired by an Icelandic folk tale, and what it might be like to be in that folk-tale character’s unusual situation, as well as one particularly expressive cat. The shadows between the trees were dark and I stood between two birches, sniffing out the right way. My tail was high. This was no headless mouse. This would impress Ingy." • At Clarkesworld: "The Halfway House at the Heart of Darkness" by William Browning Spencer, read by Kate Baker. "Keel wore a ragged shirt with the holo Veed There, Simmed That shimmering on it. She wore it in and out of the virtual. If she was in an interactive virtual, the other players sometimes complained. 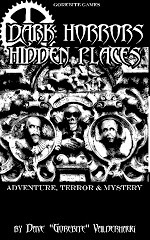 Amid the dragons and elves and swords of fire, a bramble-haired girl, obviously spiking her virtual with drugs and refusing to tune her shirt to something suitably medieval, could be distracting"
• At DriveThruRPG: Dark Horrors Hidden Places by Dave Valderhaug. "Pay what you want"
"DHHP is a dark gothic horror system with simple rules for quick play.Included is the adventure "The purge of Portland road." . . . "The world is shattered. Where once stood streets and entire cities now lies rubble. The sadistic among the population have taken to the underground in order to torture and torment the poor and weak. Strange creatures spill forth onto the streets of towns and cities, as the governments struggle to keep these monstrosities a secret."